In this video, we will discuss implementing auto-complete functionality in an asp.net web forms application using jQuery Autocomplete Widget and a web service. Step 2: Download autocomplete widget from http://jqueryui.com/download. The following folders and files will be downloded. 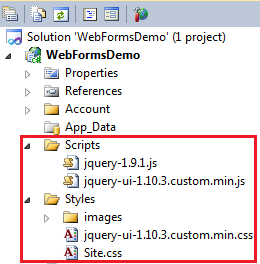 Step 3: Open "js" folder copy "jquery-1.9.1.js" and "jquery-ui-1.10.3.custom.min.js" files and paste them in the "Scripts" folder of your asp.net project. Now open "css" folder. This folder will be present in "ui-lightness" folder. Copy "images" folder and "jquery-ui-1.10.3.custom.min.css" file and paste them in "Styles" folder in your asp.net project. If you are following along, at this point your solution explorer should look as shown below. Step 4: Right click on the project name in "Solution Explorer" and add a Web Service with name = StudentService.asmx. Copy and paste the following code. 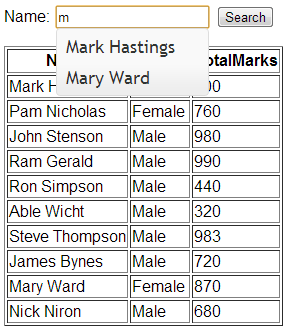 This web service is responsible for retrieving matching student names to implement auto-complete when the user types the name of the student in the textbox. What is Web Part and how it differ from user control and custom control.. I have maskedtextbox in windows c# application and i am using this to enter date in dd/mm/yyyy format and saving that entered date in sql server 2008 table but after 12/09/2013 it is throwing a error called out-of-range value because sql server 2008 accept date in mm/dd/yyyy format So NOW may question is how to insert or convert date in mm/dd/yyyy format? I'm using an Access Database in my application, and seems like the web service is not getting data from the Access Database, probably due to security issues, any ideas on how to solve this in the simplest way?! hello sir , please upload tuttorials for LINQ i am in great need of this..
and i constantly follow only ur vedios. How can i use this function in TextBox In GridView? says txtStudentName is not valid. how can I refer to the textbox in the content page? Or, if possible, how can i move the whole head section in the content page? if i try, vs says it's non allowed.